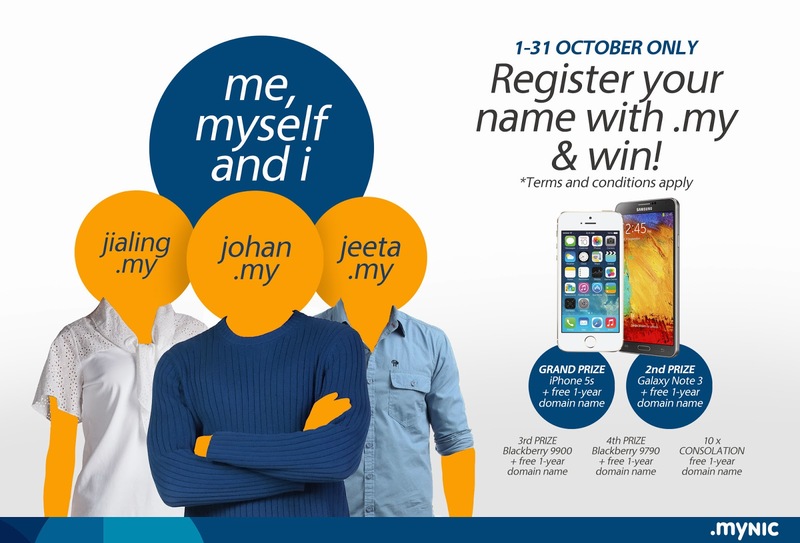 MYNIC New Campaign "Me, Myself and I"
What is the Terms & Conditions? The closing date for this contest is 31st October 2013 at 11.59 p.m.
Open for .my domain name only (example johan.my). Multiple entries are allowed. All prizes are subject to availability and MYNIC reserves the right to replace the prize with an alternative product or color of equal or higher value if necessary. Lucky draws and competitions are only open to Malaysian citizens. The promotions are open to public - with the exception of any employees (and their families), their agents or related third parties who are directly connected with the administration of MYNIC Berhad. Winner(s) will be selected at random after the closing date by MYNIC Berhad from all entries received. The judge's decision is final and no correspondence will be entered into. Winner(s) will be notified by email or telephone (using the details provided at entry). If MYNIC Berhad cannot: (i) contact the winner (via the details provided at the date of entry) within a reasonable period of time (to be established at the MYNIC's sole discretion); or (ii) the winner does not return confirmation of their attendance for the prize giving ceremony to MYNIC Berhad within 7 days of notification that they have won the Prize, MYNIC Berhad reserves the right to re-draw a winner of the Promotion and thereafter until a winner on these terms is found. MYNIC Berhad accepts no responsibility for the Prizes being lost, damaged or delayed after the winners receive their prizes. By entering this contest you agree to having your name, details and photo published online or in a future issue of MYNIC Berhad campaigns and promotions.